Reading for religious literacy: ideas, resources, strategies. for the latest version of this entry. Now that I have finished doing the Vulgate Verses book, I have the pleasure of getting to comment on some of these verses here, focusing on the verses that seem to me to have a special significance for religious literacy and topics of general interest, completely aside from the Latin itself. You can see other posts in this series by clicking on the Vulgate Verses label. The verse I have chosen for today is Luke 10:41: Martha Martha sollicita es et turbaris erga plurima, "Martha, Martha, you are a worrier and you are getting upset about so many things." This comes from the story of Jesus's visit to the house of Martha and Mary. In addition to this passage in Luke, Martha also figures in the Gospel of John, in the story of the raising of Lazarus, the brother of Martha and Mary. In this passage it says that it was Martha who came to greet Jesus, while Mary stayed at home (John 11:20). When Martha finds Jesus she rebukes him for not having been present to save her brother! Yet she still has faith: "But I know, that even now, whatsoever thou wilt ask of God, God will give it thee" (John 11:22). Jesus then preaches to her about the resurrection. Then, later, when Jesus orders that the stone be removed from Lazarus's tomb, Martha protests: "Lord, by this time he stinketh: for he hath been dead four days" (John 12:39). Jesus then reminds her that she must believe. Martha's boldness and everyday qualities make her a striking figure in the Bible, one of the most interesting female characters in the New Testament. Not surprisingly, there are also legends about Martha beyond the Biblical text. According to one legend, Martha journeyed with Lazarus and Mary to the island of Cyprus, where Lazarus was a bishop. The three of them died there in Cyprus. According to another legend, Martha went with Mary to France and battled the dreaded monster called the Tarasque! You can read about that in the life of Saint Martha in the Golden Legend. There is also a fine poem by Rudyard Kipling: The Sons of Martha. The subject of Martha and Mary has attracted many painters, and you can find quite a few examples collected at wikipedia. Not included there is a fascinating study by Caravaggio. Probably the most famous is a painting of Martha and Mary by Velázquez: Kitchen Scene with Christ in the House of Martha and Mary. Here we see Martha, looking despondent in the foreground (attended by a dire-looking old woman), while we can glimpse Mary with Jesus in the background. 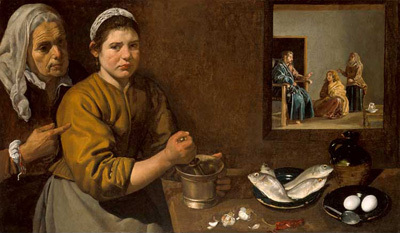 The painting combines the qualities of a still-life (with the symbolic fish and eggs on the table) as well as illustrating the Biblical passage! Incidentally, Martha is regarded as the patron saint of both servants and cooks.